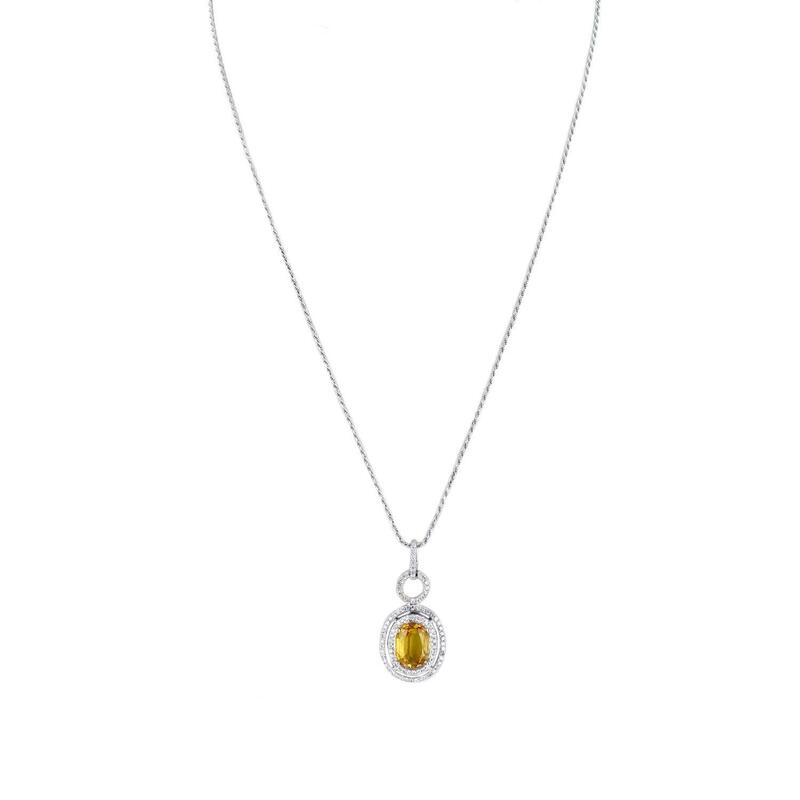 One electronically tested 14KT white gold ladies cast & assembled yellow sapphire and diamond pendant with chain. The pendant features a yellow sapphire set within tiered diamond bezels under a diamond ribbon circle, completed by a diamond set bail. The pendant is supported by an eighteen inch length 14KT white gold designer style chain, terminating in a lobster claw clasp. Bright polish finish. Trademark is Orianne. Identified with markings of "14K". Condition is new, good workmanship. One prong set oval mixed cut natural yellow sapphire approximate weight of 4.38ct., clarity is eye clean, type II, medium, moderately strong, orangy yellow color, (GIA oY 5/4), cut is good. Transmitting light with no distortion, transparent. Graded in the setting. Ninety-Six prong set round brilliant cut diamonds approximate total weight of 96 Stones = 0.53ct. Graded in the setting. Total Weight of Colored Stones 4.38 ct.
Total Weight of Diamonds 0.53 ct.